The job numbers are out and they have been revised to make them look a lot better than they really are, this is part of the plan, Trump is using the manipulation against the [DS] and MSM. Manufacturing jobs have surged, Trump is preparing the country for the transition. The US debt is increasing at a rapid pace and countries around the world are dumping treasuries. So is buying the treasuries, retirement investments, hedge fund and banks. The central banks are purchasing gold, it’s like they know something and they don’t want to share it. More MSM outlets are laying of people. Booker is now running for President.More leaks and it shows Comey lied, he testimony does not fit Preistabs account of what happened. Donald Trump Jr phone call to his father while in Trump Tower turns out to be false, Schiff falls flat on his face. Pelosi playing with words when talking about the border wall. Did Trump just expose the neocons, MSM and others when he made that call to the opposition leader in Venezuela. Trump tweets about ending the wars the DS started. 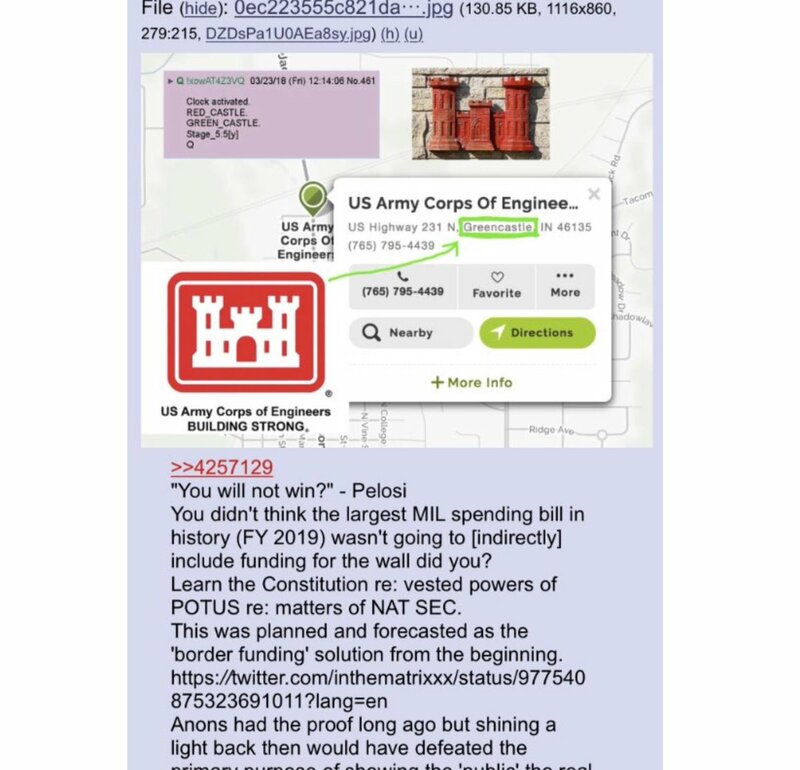 Q is back and he posted two new posts. It seems the patriots are ready to fire back, target locked on, incoming, wait for it, here comes the booms. 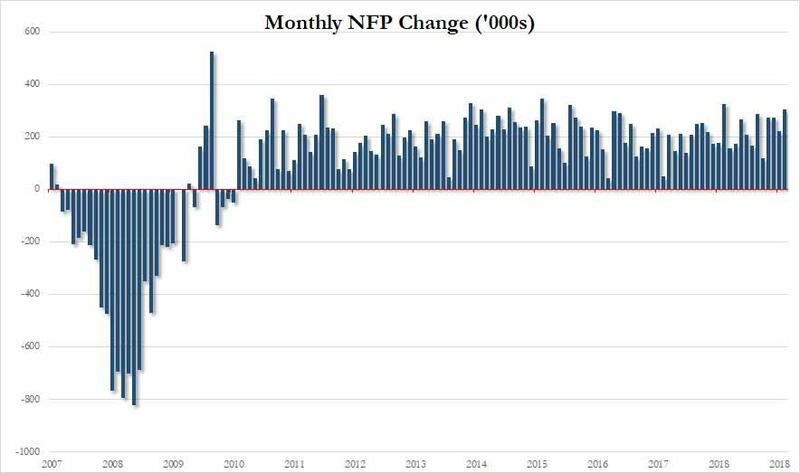 It’s official: January marked the record 100th consecutive month of consecutive job growth, and it did so in style, with the US adding a whopping 304K jobs last month, nearly double the 165K expected, however much of this appears to have come at the expense of a revised December number which was revised lower from 312K to 222K. The unemployment rate rose again, printing at 4.0%, up from 3.9% last month, and above the 3.9% expected. 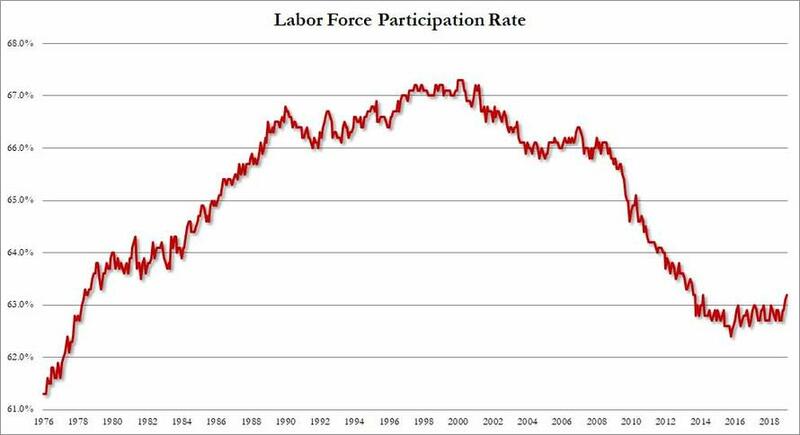 More notably, the labor force participation rate rose again, hitting 63.2%, the highest level since March 2014 as more people jump back into the labor force. As the BLS notes, the number of persons employed part time for economic reasons (sometimes referred to as involuntary part-time workers) increased by about one-half million to 5.1 million in January. Employment in federal government was essentially unchanged in January (+1,000). Federal employees on furlough during the partial government shutdown were counted as employed in the establishment survey because they worked or received pay (or will receive pay) for the pay period that included the 12th of the month. 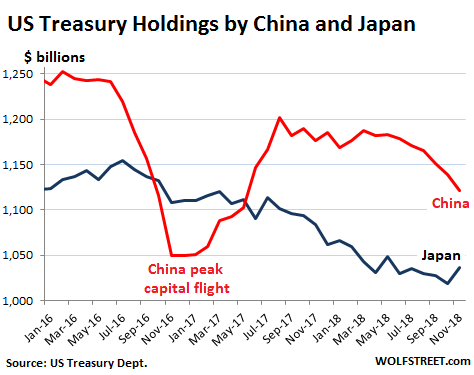 Under the impact of a stupendous spending binge peppered with juicy tax cuts, the Treasury Department has had to issue a flood of Treasury securities to fund the cash outflow. So, over the past 12 months, the US gross national debt has ballooned by $1.5 trillion to $22 trillion as of January 30, according to Treasury Department data. And these are the good times when the economy is hopping. who the heck is buying all this debt? So, who bought this pile of debt that got issued in 12 months? China, Japan, other foreign investors? Nope. All foreign investors combined slashed their holdings of marketable Treasury securities in November by $105 billion from November a year earlier, to $6.2 trillion, according to the Treasury Department’s TIC data released today. private-sector investors (foreign hedge funds, banks, individuals, etc.) increased their holdings by $52 billion, to $2.3 trillion. Japan’s holdings fell by $47 billion from a year earlier to $1.04 trillion, having now reduced its stash by 16% since the peak at the end of 2014 ($1.24 trillion). 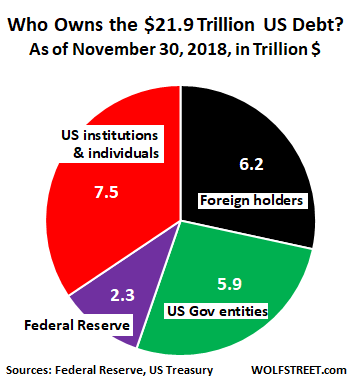 Foreign holders (official and private-sector), net seller, shed $105 billion — to $6.2 trillion, or to 28.4% of total US debt. Federal Reserve, net seller, shed $204 billion — to $2.25 trillion through November 30, or to 10.3% of the total US national debt. US government entities (pension funds, Social Security, etc. 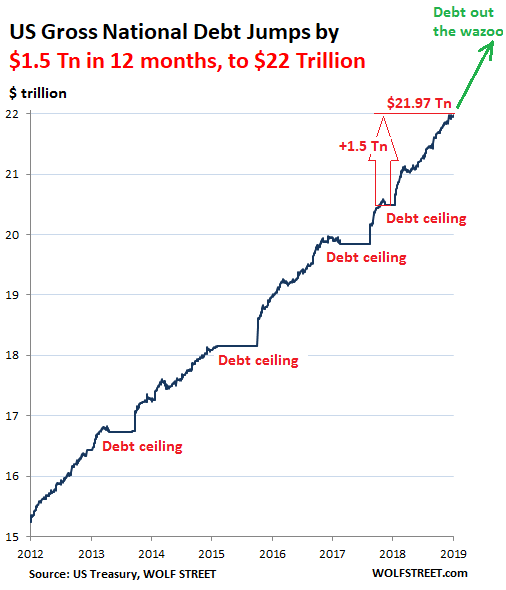 ), net buyers, increased holdings by $20 billion — to 5.87 trillion, or 26.9% of the total US national debt. This “debt held internally” is owed the beneficiaries of those funds. American banks (very large holders), hedge funds, pension funds, mutual funds, and other institutions along with individual investors in their brokerage accounts or at their accounts with the US Treasury were huge net buyers, while nearly everyone else was selling, increasing their holdings by $1.36 trillion over the 12-month period. These American entities combined owned the remainder of the US gross national debt, $7.5 trillion, or 34.4% of the total! 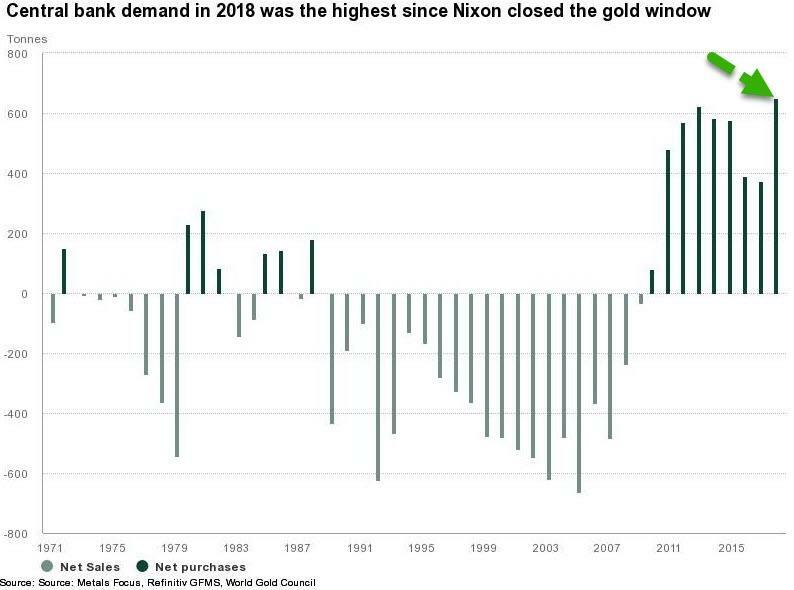 2018 gold buying spree by central banks isn’t just the biggest in 47 years, but also the second highest annual total on record (only surpassed by 1967, when central bank gold reserves increased by 1,404 tonnes). More central banks look to gold. Russia, Kazakhstan and Turkey again accounted for a large portion of demand in 2018. Indian net purchases were another notable component of central bank demand in 2018. So, what do the central banks know , why are they keeping this a secret. Following mass layoffs at Buzzfeed, the Huffington Post, Gannett and Verizon Media Group last week, Vice Media has become the latest trendy new media darling to announce deep cuts to staffing levels. The Hollywood Reporter reported Friday morning that the cuts will impact around 250 people, and are part of new CEO Nancy Dubuc’s “strategic plan” to cut back on spending and “achieve profitability.” The cuts, which will be distributed across “all departments at every level”, will total roughly 10% of the company’s workforce. the senator is coming off a string of embarrassing scandals that will likely be seized on by primary opponents: During one of the most memorable moments of the Kavanaugh hearings, Booker released 12 pages of confidential emails – purportedly risking censure or expulsion from the senate – which the Washington Examiner famously decried as a “total dud.” More ominously, Booker – who is reportedly dating actress Rosario Dawson – was accused of sexually assaulting a man in a men’s restroom. Another Leaked Transcript: Bill Priestap “Closed” Testimony Conflicts With James Comey “Open” Testimony…. Another unsourced leak of a congressional hearing transcript to The Epoch Times highlights the testimony of former FBI Director of Counterintelligence, Bill Priestap. The question surrounds why congressional leadership, including the Gang-of-Eight, were not briefed about the opening of a counterintelligence operation into a presidential campaign. The investigation began on July 31st, 2016. Congress was not notified until early March 2017. So in open testimony Comey said congress was not notified upon the advice of the Director of Counterintelligence, Bill Priestap. However, in closed testimony Bill Priestap says congress was not notified because of a decision by FBI Director James Comey. The sound of sad trombones echos through the halls of media networks today as a year of speculation, surrounding contacts between Don Trump Jr. and ‘blocked phone records’ before and after the oft-emphasized Trump Tower meeting, ends with congress identifying two long-time Trump friends and a major nothing-burger. VIA ABC NEWS – Investigators on the Senate Intelligence Committee have learned the identities of three blocked phone calls with Donald Trump Jr just before and after the now-infamous Trump Tower meeting on June 9, 2016, t .
President Trump on Thursday dismissed special counsel Robert Mueller‘s investigation into his former associates and his presidential campaign in a New York Times interview in which the president said Deputy Attorney General Rod Rosenstein told him the probe does not view him as a target. Americans have pretty much given up on trusting Washington to handle big problems, according to a new survey. 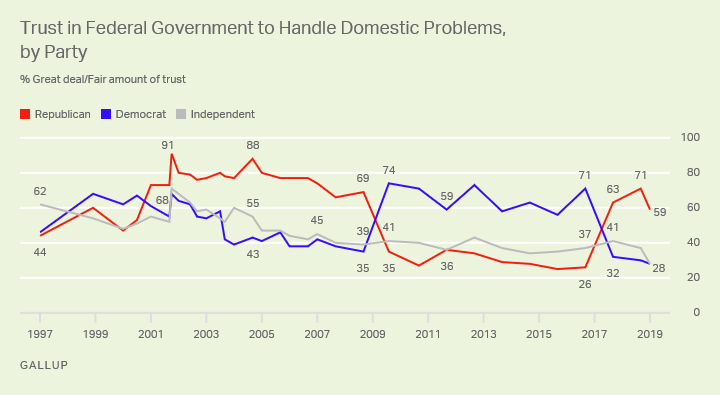 For different reasons, just 35 percent trust the government to handle domestic problems and 41 percent international issues, said Gallup. Those are “record lows” on issues Gallup has been following for two decades, said the polling outfit. House Speaker Nancy Pelosi starts shifting the semantic granules to avoid a political loss. 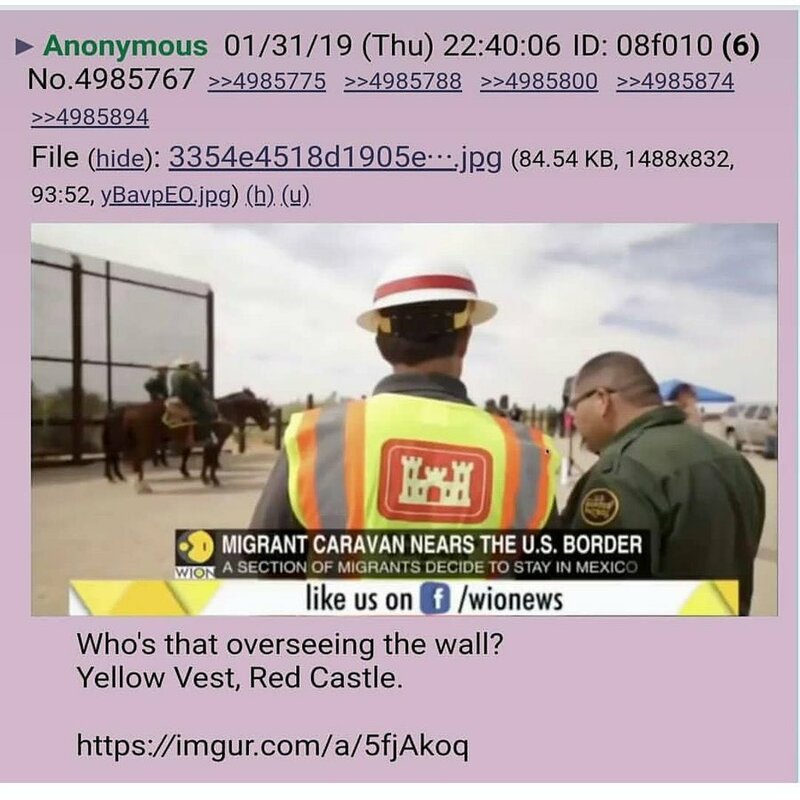 The financing for, and construction of, a see-through fencing system (Trump’s position) is the request of DHS and Border Patrol, and supported by the vast majority of Americans. What does this tell us, they are pushing gun control once again and to get movement they will need an event, so I would expect to see a shooting at another school, or any other place, the MSM will play this up big time to get these narrative moving, the same people will be out on the front line pushing gun control. Get ready for another false flag. Remember on Feb 14 there was a school shooting in Parkland Florida. Caracas reportedly needs cash for imports of basic products that it sells to the population at subsidized prices. A possible explanation for the payment for the gold in euros is US sanctions, which restrict Venezuela’s use of the dollar. .Many members of the US Congress are greatly concerned by supposed ‘Russian meddling’ in American affairs. But what do they think about Washington openly getting behind the opposition in Venezuela? The politicians were visibly caught off guard by pretty simple and straightforward questions. Several lawmakers couldn’t provide a definitive answer to whether the US public support for opposition leader Juan Guaido could be considered ‘meddling’ in a foreign nation’s affairs.“Haven’t thought about that,” a baffled lawmaker was heard saying when asked how he would react if Russia recognized House Speaker Nancy Pelosi as president of the US.Washington did something similar to that last week, when President Donald Trump recognized the speaker of Venezuela’s opposition-controlled parliament, Guaido, as the legitimate leader of the country. What happens if this movement goes no where and the people do not answer the call, will Trump then speak to Maduro and restablish relations, if the people do answer the call then it is the people that have decided. The United States is suspending its participation in a key arms control agreement with Russia, and will leave the pact completely in six months, the Trump administration announced Friday. The decision to abandon the Intermediate-Range Nuclear Forces Treaty has raised concerns about a renewed arms race with Moscow. But it’s not a surprise: The Trump administration has been signaling for months that it will walk away from the treaty, alleging that Russia has not met its obligations under the agreement for years.
. Fake news smears of Covington Catholic teens 19 Jan.
Dems know Roe v Wade in jeopardy w/more conservative SCOTUS esp w/RBG future in question. NY signed abortion law allowing full-term abortions. VA & others doing the same. That same day, the 5th District Court of appeals paved the way for Texas to strip Planned Parenthood of Medicaid Funds. The American pro-life position will get primetime treatment during President Trump’s State of the Union address next Tuesday in response to the radical abortion laws being pushed in Democrat-controlled states like New York and Virginia. A pair of U.S. Air Force F-15E Strike Eagles fly over northern Iraq after conducting airstrikes against Islamic State of Iraq and the Levant targets targets in Syria, Sept. 23, 2014. DOD photo.